I have always been drawn to India. The vibrancy of its markets, its history, unique landscapes, fashion, food and of course its people. Until recently it had sadly only held a place on my bucket list. The reason for this? I had never had anyone to go with! It hadn’t appealed to past boyfriends or many of my friends - and it was one place I felt, and quite rightly so, a little nervous travelling to as a woman on my own. So you can imagine my joy when I found out I would be heading there with a team for a company photoshoot - the perks of working for a travel brand! The focus of the photoshoot was to push one of my company's brands, Luxury Gold, on its Imperial Rajasthan journey, which allowed us to see the highlights of Delhi, Agra, Jaipur, Udaipur and Jodphur. From rickshaw rides and spice markets in Delhi, to the iconic Taj Mahal and Jodphur’s impressive Mehrangarh Fort, I was thrown in at the deep end and couldn’t have asked for a more fulfilling experience - well maybe throwing on my backpack and roughing a little, but we’ll save that for next time. The trip began with a lady I met on an overnight plane to New Delhi. She was travelling with her young family back to Gurgaon, where she is based, and coincidently where my hotel was situated. She wrote down a list of places to check out and insisted on me taking her number in case I needed some help. “You have to be careful of travelling alone here as a woman. Don’t wander by yourself and if you get lost please don’t hesitate to call me,” she kindly repeated. Her adorable little girl came and sat next to me for the end of the flight so she could see the plane land “properly”- I think we were both as excited as each other! Everywhere we went, we were met with warm hospitality. From the kind smiles of the locals to the cheeky chat of Delhi based Benoy, who was helping me lead the trip, it was great to find a place filled with welcoming faces and unrestrained laughter. Along with beaming smiles, we were met with plenty of cameras and selfie requests. I don’t think it helped we were travelling as a crew doing a photoshoot, which only attracted more interest, with groups of people lining up to see what we were doing. As the only member stood alone, art directing from the side, I was placed as the target for such requests, with numerous people asking to have a picture with my tall, pale self. If you spot a bad meme online of a girl holding a million bags and looking pretty, erm, sweaty in 40 degree heat, it’s probably me. While at a fabric shop in Jodphur, not only did we receive selfie requests, but apparently I reinvented myself entirely. The owner of the shop asked if I was an "international supermodel”. This was probably down to the fact I am pretty lanky or more likely, he wanted to flatter me in order to buy something - I'll pretend it's the former. Before I could reply, Maria one of our actual models shouted, “Yes, she’s an international star - haven’t you seen her before?”. He nodded and said “of course”. Before I knew it, he had told a number of men who worked in the building of the news. On my way out they all ran over asking for autographs and selfies with Rachelle (pronounced the French way of course). Egged on by Maria’s cheekiness, I agreed. I probably shouldn't show my face in Jodphur ever again. Unlike my supermodel alter ego Rachelle, I love food and was happy to indulge while away. My ten days were spent in a happy food coma, stocked up on chai tea, freshly made naan and of course local spicy delicacies. I tried indulgent local foods such as jalebi and kachori, and have probably returned to Switzerland 7lbs heavier. Prepare to see Rachelle splashed across the newspapers for an article on her shocking celebrity weight gain. No matter who you tell you’re going to India (whether they have been there or not), they will undoubtedly turn to you with a concerned look before listing off the things you should be wary of. The meat, the water, swimming in pools and of course the dreaded Delhi belly. I’m never sick and I don’t like to take medicine in any form, be it antibiotics or painkillers - they are a last resort. Call me a hippy or even stupid but I like to think a healthy diet and exercise has my back - it has so far (minus that one time in Ukraine when I had a failing kidney, but that’s another story...). While our videographer and usual food lover, Will, avoided all spicy foods and meat - his diet existed of naan and bananas- I wanted to try as much as I could, as did the rest of the crew. Despite the fear, there was just one day I felt sick, though a couple of the other members of the team were not so lucky. Even Will on his banana and naan diet ended up getting poorly. The only one of us who did not suffer was our photographer and adventurer Mr Treadway, who has spent many years living in both India and Nepal. While I was lucky on the trip, I wouldn’t necessarily recommend India as a honeymoon or first couples holiday destination. Nothing says romance quite like one of you throwing up in a toilet for half a week. Everywhere I went I was greeted with “good morning ma'am” or “hello ma'am” and the gents in our group were welcomed with the formal “sir”. While this all came with happy smiles and is a common form of address in India, I couldn’t help but feel like a middle aged school teacher waiting on homework. As someone who is fascinated by the philosophy of yoga and who regularly partakes in vinyasa yoga classes, gong classes and tries to meditate daily, I can understand why this alluring part of the world has attracted so many people looking to "find themselves" or connect to something greater than themselves - cliche I know. There is so much to be learnt about this ascetic practice in its home country and talking to my Delhi colleague Benoy, has only made me keen to head out to northern India for a few months to find out more. It wasn't just my yogi loving self that was satisfied with India, but all aspects of my being. As someone that is fascinated with religion and different culture's ideologies, I found it compelling to find out more about the land I was travelling through. Speaking to our local guide Raj, I was taught about the importance of astrology and even star signs in determining who will make a good couple when it comes to marriage in the Hindu culture. They are more complex than the star signs I am used to in the western world and go off specific birth times, the day and year of birth, as opposed to just the month. You match a couple's characteristics based on the date they are born and as I recall Raj saying, "if you have over 22 matching you're considered a good pair". Maybe I should take note, I always go for Virgos (predictable, reliable, in need of order, September babies), despite the fact they aren’t the best sign to match with an (adventurous/fiery/moody/unpredictable) Sagittarius gal. From monkeys getting a little too close during a sunset dinner, to thousands of bats circling us in Udaipur and the sight of elephants walking down the road, India is an exciting mix of exotic wildlife and a budding photographer's dream. However, I would recommend doing your research! Our photographer's encounter with a tarantula sized spider (we still don't know what kind it was), left me terrified to go to the bathroom - apparently it had crawled in through the toilet. 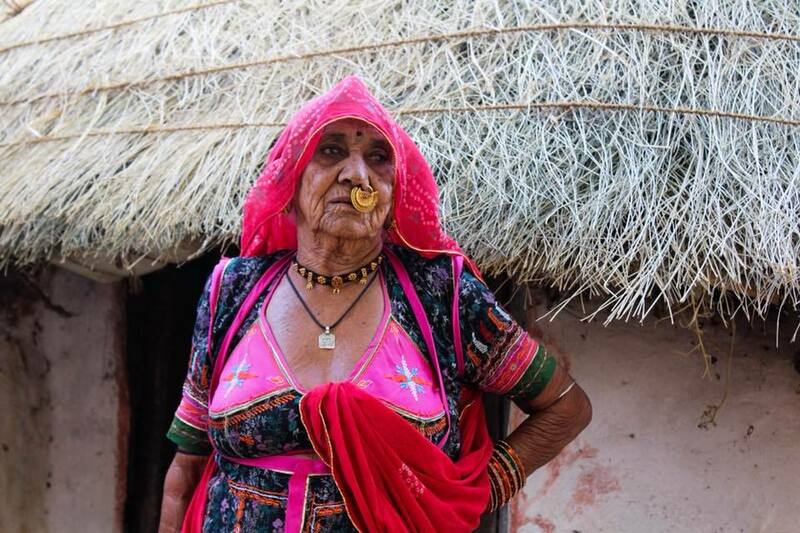 I was also left a little unnerved in Bishnoi village with my driver's tales of people "going missing" after being bitten by rattlesnakes and cobras during monsoon season. Why had I walked so gallantly through a dark polo field just two nights earlier? Other than for work, I’m not a big planner. I like going with the flow and love nothing more than a little spontaneous adventure. Hell for me is walking the same route to work every day, spending too long in one place or for that matter, repetition of any kind - I’m not the kind of girl that appreciates Netflix marathons, in fact I can’t actually remember the last time I watched television. India was perfect for this - plans always take that little bit longer and nothing is certain. Getting to a destination on time was near impossible, with transportation often consisting of an exciting but unreliable rickshaw ride - on one occasion the tyre of our model's rickshaw burst, leaving them slowly and comically trying to catch the rest of the group up. It is also good to know that in India shaking your head from side to side actually means yes. Our refusal into places before hours changed when we arrived and asked in person. 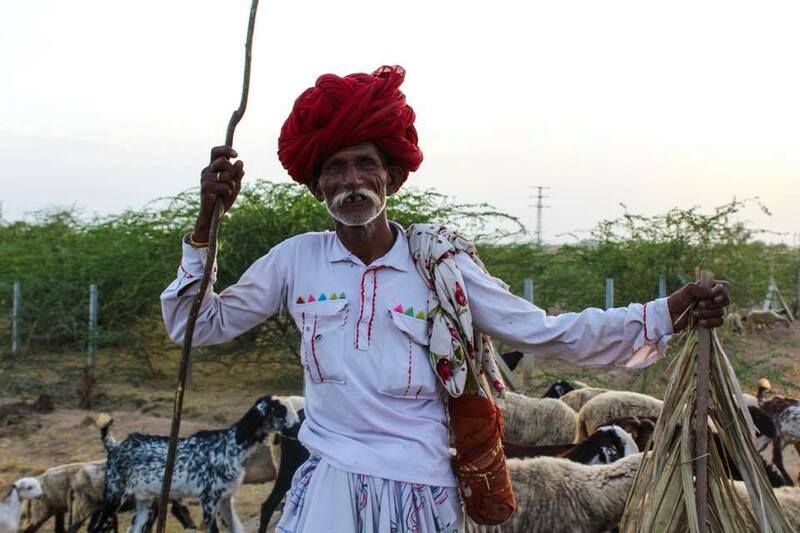 And even a Rajasthani farmer, who didn't want to let our photographer take his picture, suddenly changed his mind and agreed to his own photoshoot. No never meant no and we were never fully able to stick to a plan. Even the weather wasn’t predictable. We went from having 40 degree sweltering heat and sunshine to the whole hotel being flooded on a violently stormy evening in Agra. The devastation it caused to the local area was heartbreaking, with people’s homes and businesses ruined. But the area’s local residents responded calmly and in a collected manner, all getting on with things as normal and helping each other restore the area - a lesson on perspective to those (including me) whose whole life breaks down over the simplest of work worries or dramas with friends and family. My only regret is that I didn’t spend longer there. The people are truly beautiful, the landscapes unparalleled and the culture exceptionally hospitable. I can understand why people, including our photographer, fall in love with the country and end up staying out there for years - I think if I had had the opportunity I would have done the same. My trip has only got me eager to head back with a backpack and to explore more of India before hopefully heading on to Nepal and Bhutan. Whose joining me?